Starting last season and continuing into this season, the Yankees have reemerged as a true baseball power and World Series contender. Last year they exceeded expectations and went to Game Seven of the ALCS. This year they’re currently tied for the best record in baseball and there is every reason to believe they are one of the three or four best teams in the sport. Maybe they’ll emerge as the best team once the 162-game season plays out. You don’t turn things around as quickly as the Yankees have — remember how overwhelmingly mediocre this team was in 2016? — without a little bit of luck. Most notably, at the 2016 deadline the Yankees had two elite relievers (Andrew Miller and Aroldis Chapman) for sale at a time when two teams with long World Series droughts (Indians and Cubs) needed bullpen help and were willing to pay big to get over the hump. Good timing, that was. Those trades were a perfect storm. 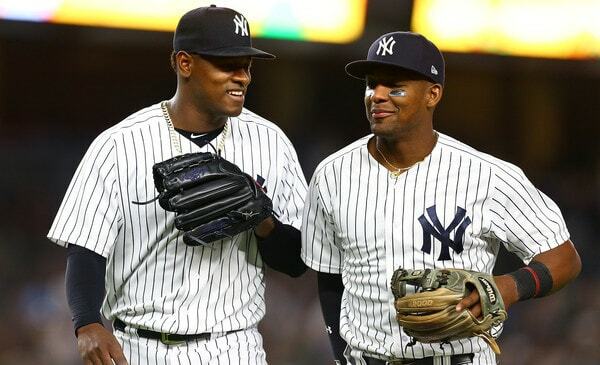 Beyond the luck factor and their ability to spend money — trading Chapman for Gleyber Torres only to re-sign Chapman a few months later was a nifty little move — the single biggest reason the Yankees are in the position they are in today is their player development. From 2007-14, the system produced Brett Gardner, David Robertson, Phil Hughes, Joba Chamberlain, and Ian Kennedy. That’s pretty much it. Not much help at all. For years and years I beat the “the Yankees are good at acquiring talent but stink as developing it” drum. The Yankees drafted talented players and signed top prospects internationally. Those players were stalling out or failing to reach their ceiling at an alarming rate. So, in October 2014, the Yankees replaced longtime farm system head Mark Newman with Gary Denbo. Fair or not, Denbo gets a ton of credit for the improved player development. To me, two things stand out the most about the Yankees and their recent player development success. One, the Yankees suddenly have a knack for getting players to exceed their perceived ceiling. Aaron Judge went from having grave concerns about his swings and misses to being a star. Luis Severino went from possible reliever profile to Cy Young candidate. Jordan Montgomery’s stuff improved in pro ball and he went from potential fifth starter/swingman type to bonafide big league starter. We should also include Didi Gregorius here, because development does not stop when a player reaches the big leagues. Gregorius is better than everyone expected. Everyone. Give Brian Cashman a truth serum and I’m sure he’d tell you the Yankees never expected Didi to be this good. Chad Green is a monster. Aaron Hicks has had far and away the most success of his big league career in pinstripes. And don’t forget about all the late round draft picks the Yankees developed into legitimate prospects. Cody Carroll was a 22nd round pick and we’re probably going to see him in the bullpen at some point this year. Dustin Fowler was an 18th round pick who become a borderline top 100 prospect. Dietrich Enns was an 18th round pick who blew out his arm, came back better than ever, and was a trade chip. This sort of late round development never happened in the pre-Denbo years. The second thing that stands out to me is that when these kids reach the big leagues, they’re ready to produce pretty much right away. Severino and Greg Bird were great in 2015. Gary Sanchez had a record breaking debut in 2016. Judge needed less than 100 plate appearances to get acclimated in 2016 before becoming an MVP candidate in 2017. Montgomery stepped into the rotation and produced right away. Miguel Andujar came up and hit right away. Torres came up and hit right away. There are always exceptions — Tyler Wade hasn’t hit and Severino did struggle in 2016 — but by and large, when the Yankees call someone up, it doesn’t take long for the kid to produce. I don’t think that’s all one giant coincidence. I think the Yankees prepare these guys well in the minors and I think they’re very good at evaluating who is ready for the big leagues, both physically and mentally. That’s why, for example, when the Yankees do something like not call up Chance Adams despite the need for another pitcher, I’m inclined to say he’s not ready. They know what they’re doing. There is, undoubtedly, a lot of luck involved in player development. Even the smartest organizations can’t fully prevent pitcher injuries or teach every hitter how to recognize a breaking ball. Baseball is hard. You acquire lots of prospects and hope to hit on a few, and that is pretty much exactly what the Yankees have done, albeit at a rate greater than any other team these last two or three years. Since revenue sharing became a thing, it is no longer possible to build a team through free agency. You can’t just buy players and expect to contend. This is a young man’s game now and the Yankees were never going to get where they are today without drastically improving their player development. Perhaps Denbo, who joined Derek Jeter and the Marlins over the winter, gets too much credit for the recent player development success. Either way, the Yankees are again a baseball powerhouse thanks to the guys that have come out of their farm system, not some other team’s.